AKiTiO has announced its new Thunderbolt 3 dock for high-end mobile workstations. 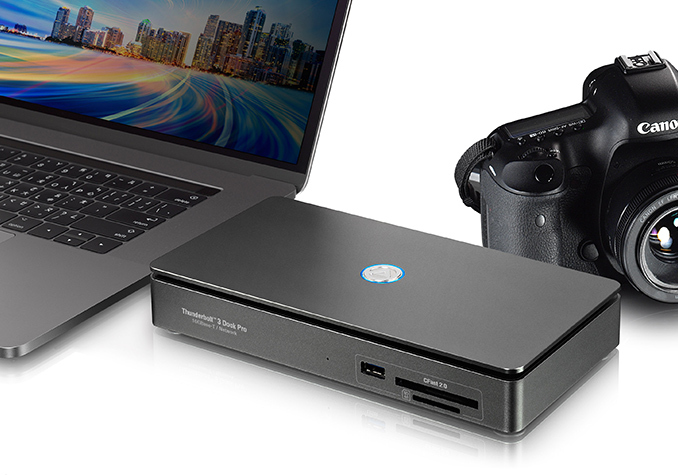 AKiTiO’s Thunderbolt 3 Dock Pro features a 10 GbE port enabled by an Aquantia chip, along with multiple USB Type-A ports, card readers, eSATA, and other connectors. The Thunderbolt 3 Dock Pro from AKiTiO is aimed at creative professionals who happen to use 10 GbE Ethernet (or other multi-Gig options), so the vast majority of its owners right now will be from corporate space. In terms of connectors, the Thunderbolt 3 Dock Pro has three USB 3.1 Type-A ports (one on the front, two on the back), one eSATA header, a DisplayPort, a 10 GbE RJ45 port enabled by Aquantia’s AQtion AQC-107 silicon, a 6-pin power input, and two TB3 connectors with 15 W and 60 W power delivery. The complexity of AKiTiO’s Thunderbolt 3 dock should be rather formidable as AQtion AQC-107 silicon connects using a PCIe interface, whereas eSATA requires a separate controller. To cool down the device, AKiTiO uses a fan that can still be turned off in a bid to make the dock whisper quiet. AKiTiO has not announced details about pricing of its Thunderbolt 3 Dock Pro, but keeping in mind that this is the only TB3 docking solution for Apple’s MacBook Pro and other high-end laptops, we expect the device to carry a premium price tag. Looks nice, but wth is that power connector doing there?! If this is like other AQN-107 NICs in a Mac system, the Ethernet port will also function as an AVB audio-over-network solution. With 10 Gbit of bandwidth to play around with, conceptually you could hit 1152 audio channels out of it (though 1024 is the more realistic limit due to other factors like maximum 802.3Qav streams through a switch).